I am excited to announce that I am hosting a Twitter Party this Friday along with Boots Seventeen makeup artist Vanesa Guallar (@vanesaguallar) and Natalya from Filthy Gorgeous Makeup (@NatalyaFGM)! Join us on Friday 22nd March between 1pm-2pm over on Twitter @perfectpolished when we will be sharing our makeup tips and top trends for Spring/Summer. Being spontaneous with colour and styling can leave us feeling and looking fabulous! Trying something new can be fun and make you beam with confidence. 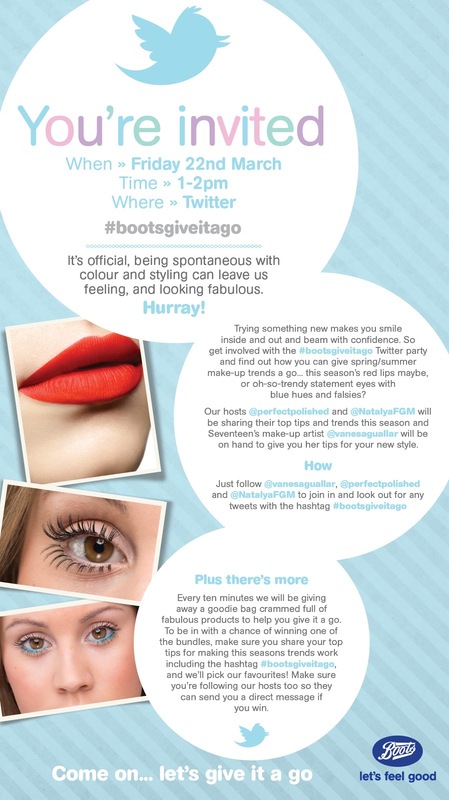 So get involved with the #bootsgiveitago Twitter Party and find out how you can give Spring/Summer make-up trends a go! Ever tried a statement red lip? Created the perfect smokey eye look? Been adventurous with False lashes? If not, Give it a Go! You can tweet us your makeup questions and share your top tips or even a picture if you fancy using the hashtag #bootsgiveitago. That’s not all....every ten minutes we shall we giving away a goodie bag crammed full of fabulous products to help you give it a go! To be in with a chance of winning one of the bundles, make sure you share your top tips for making this seasons trends work including the hashtag #bootsgiveitago, and we’ll pick our favourites! Make sure you are following me on Twitter @perfectpolished so I can DM if you are a lucky winner! Looking forward to Tweeting with you all on Friday!